Discover the Best Folding Knife: Ultimate Pocket Knife Buyers Guide! What is a Folding Knife? You need a new pocket knife & being frank you want to buy the best folding knife available. Use our extensive & interactive chart to help guide you. Throughout your life – there are numerous times when having a solid, sharp, reliable knife will literally be a life saver. Many people have an EDC (every day carry) folding knife with them at all times, because they often require a knife for many different things. 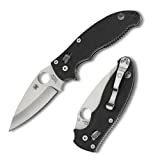 As you are reading this, you too are someone that likes to plan ahead, and want to get yourself equipped with the best folding knife available that meets your highly specific criteria, instead of wasting your money on a cheap knife from Walmart that will dull and rust before the end of the month. This interactive chart of knives and the reviews and analysis that follows will help you decide what the best knife is for you. We all have our own views on what a good knife means, maybe you like to go camping or hiking, or maybe you need something to regularly open packages with. No matter what the need we're here to help you find the absolute best folding knife that you deserve. To make it more manageable, click on any of the columns to sort the data to help make your decision easier. Click on the image, or the red link to view the knife and read the Amazon reviews. This can be really useful to help you narrow down your choices if you are stuck between a few knives. Want to See Even More Knives? Click Here to See Our Full List of Over 50 Knives! The knives included in the chart above actually only begin to scratch the surface. There are many manufacturers and a vast array of different models that exist so there is no way that we could include every knife that is for sale. I have researched for many hours to only add exceptional knives to this chart, and have also made sure that I included every price range (to suit all budgets) and from a wide variety of quality knife makers. All of the knives listed in the charts are folding blades, and the majority are manual flippers – which means that there is no spring in the body to complicate the mechanism. This in my opinion is essential criteria for finding your ultimate folding knife. A folding knife is a knife that can be closed to store the blade within the handle. The term folding knife commonly infers a knife with one to two blades approximately 3 1/2″ or longer such that it is capable of performing the same jobs as a fixed blade knife and, while they CAN be carried in a pocket, they are commonly a bit too large to do so comfortably without a pocket clip. The difference between folding knives and pocket knives can be further clarified. 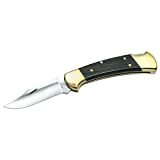 A “pocket knife” on the other hand commonly infers a knife with two to four blades, each with a distinct and easily recognizable blade shape such as a Clip Point, a Spear Point (Boy Scout knife), a Sheep's Foot, a Spay, etc., and each no longer than 3 1/2″, with a handle shape that is also of a distinct and highly recognizable pattern combined with a specific number and type of blades such as a Stockman, a Congress, a Pen, a Peanut, a Canoe, a Coke Bottle, a Gunstock, ect. and which is specifically designed to fit in the bottom of a pocket. The misconception is that folding knives are weak, but with advancements in engineering and technology they are much stronger than you think, and can really withstand some punishment. Folding knives usually have a blade length of between 2.5 to 5 inches and are incredibly versatile. You can use them from basic food prep, skinning animals all the way through to more mundane tasks that you face every day like slitting open cardboard boxes or removing tags. You can also use your knife for self defense or in emergency situations if you find yourself faced with some of these more extreme situations. Having a folding knife in your pocket could literally save your life one day. To really find the best knife you need to ask yourself a few questions. What size knife will suit you best? Will you carry the knife around in your pocket every day, or will it be left in your truck for emergencies? How much are you willing to spend on your next knife? You can see in the grid above we scale the knives from around $15 to well over $200 (should your budget stretch that far!) Above you will find an interactive comparison table displaying many of the top folding knives on the market today. Take a look at the options and criteria as well as all the data in the charts to help you make the right buying decision. I'm confident that using the Ultimate Folding Knife Comparison Guide, and answering the questions I detailed earlier – you should be able to find the perfect knife that satisfies all of your requirements and budget. To whet your appetite a little, I have written some mini-reviews on five knives that I believe should be in your short list. 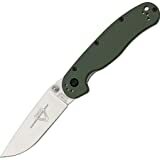 In no particular order of awesomeness are my choices for the some of the top folding knives you can buy today – with a few words describing the knife itself. When you open the box and take this knife out, the first thing you will realise is how easy it is to flip open. If this knife has any blade play (mine didn't have any) you can easily adjust it by simply tightening the pivot screw. Be careful though, fresh from the factory this knife will be razor sharp. Don't cut yourself! In you hands the ergonomic design of this knife feel great. You can get a full grip on this knife and your fingers should line up perfectly with the grooves. The textured G 10 handles provide a lot of extra grip, which is essential when using knives in the wet or damp conditions. It's super smooth, and very sturdy feeling – an excellent piece of kit. This is one of the cheapest knives that you can buy – coming in at a budget friendly 30 bucks, there is no better buy for the money. When you hold this little knife, it just feels perfect. The finger grooves line up where they should, the handle is the perfect length – not too long, nor is it too short. It's just right. The blade opens smoothly and snaps shut quickly and with a positive action. When you carry this knife around in your jeans pocket, it's slender design means that it is very subtle and non obtrusive. It just seems to disappear into the bottom of your pocket! Unlike wider knifes you'll forget you even have this with you, until you need it! Aesthetically pleasing – this Spyderco Manix 2 knife fits perfectly in your hand. The folding action is incredibly smooth and fast. This is another knife that comes very sharp out of the box, so be careful when playing with your new knife. You can use the thumb hole on the blade to flip this knife open with one hand, or you can pull down on the ball lock system and flick it open. This knife has no thumb-stud, which some people say they miss – but uses the hole in the blade instead. I prefer the hole as it reduces the knifes profile when it is in your pocket. It has the familiar Spyderco pocket click (which you can remove) which is pretty much considered perfect. The G 10 handle on this knife is suitably grippy, without being too aggressive – again perfect for using in wet conditions. This classic knife is incredibly popular with the older generation. They have been made in almost the same way for many years and they have an iconic look about them. They are a well made knife, with a decent lifetime warranty. The solid construction and large rivets allow more lateral torsion on the blade than I would be comfortable giving more modern and more expensive knives. Even if you abuse the blade, when sharpened, it always comes back able to slice through paper with razor like ease. If there is a complaint to be made about this knife, it would be that the same steel that allows for the blade's strength and ruggedness, also makes sharpening much more time consuming. However, once sharp, this iconic knife does exactly what a knife is supposed to do. This knife is considered by many to be a true work of art. This ZT knife has a thick and large stock blade. The grind on the blade is very good, and even though it is tricky to get right with a large blade – the detent is perfect. You press on the flipper and the detent releases at exactly the pressure to snap the blade open to a nice 40 degree angle, without any flick or wrist action whatsoever. The action on this knife really is a superb and tactile experience. The quality of the hardware and the fit and finish of this piece are comparable to mid-tech and custom tactical knife makers. If you have are thinking at all about buying this to add it to your collection hesitate no more! I urge you to buy this knife now, before it's too late. There can't be many left on this limited run of 1000 units. AS EXPECTED, THIS KNIFE IS NOW SOLD OUT!!! 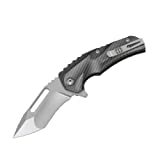 Folding Knife HQ is a participant in the Amazon Services LLC Associates Program, an affiliate advertising program designed to provide a means for sites to earn advertising fees by advertising and linking to amazon.com.